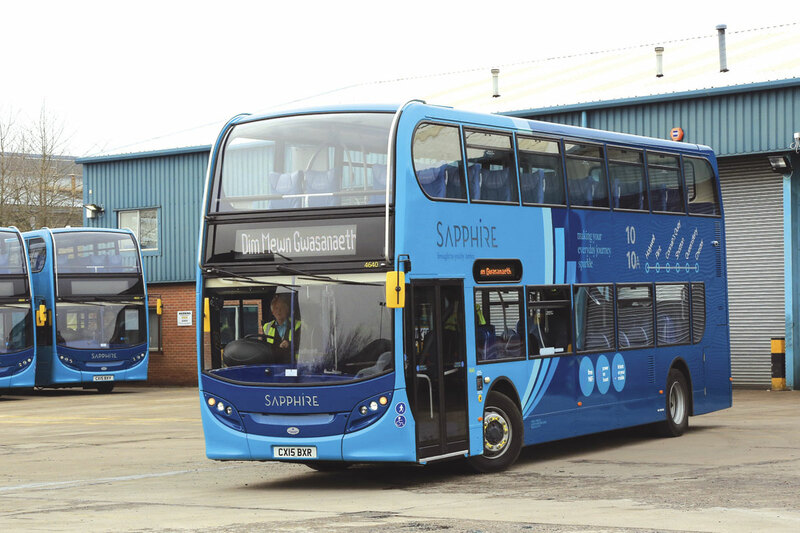 Arriva Buses Wales has continued the investment programme commenced in 2014 with the launch of nine new Sapphire standard buses for services 10/10A serving Deeside from Chester. 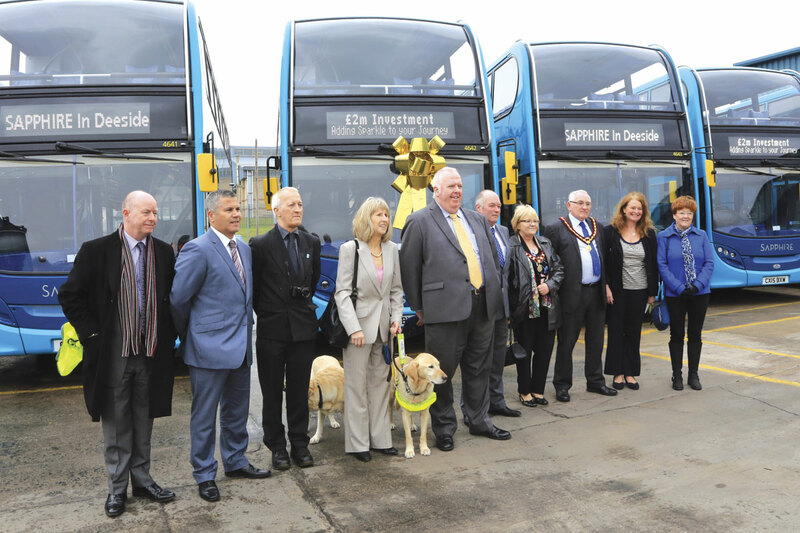 Representing a £2million investment, the fleet of ADL Enviro400s was revealed last week at the company’s Chester depot ready to enter service on 15 March. 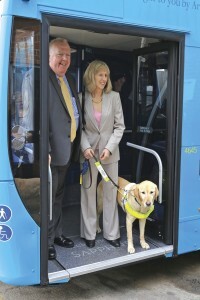 Welcoming guests including Vice-Chair, Connahs Quay Town Council, Gill Faulkner and Andrea Gordon from Guide Dogs Cymru, Arriva Buses Wales’ MD, Michael Morton, emphasised the significant investment that the company was making in North Wales resulting in 25% of the fleet being replaced in little over twelve months. With a backdrop of seven of the new vehicles, Michael reassured the audience that nine vehicles were being launched, the other two being like the ‘king’s new clothes’. In practice, they were in Rhyl supporting a short term requirement on an existing Sapphire service disrupted by bridge works. Guests then experienced a short tour of the area demonstrating the excellent ride quality of the vehicles and the clarity of the audible stop announcements. Andrea Gordon praised Arriva for being ‘a most enthusiastic supporter of talking buses’ and was keen to point out that many passengers, not just the visually impaired, benefited from the audible and on screen announcement of the stop and route information. 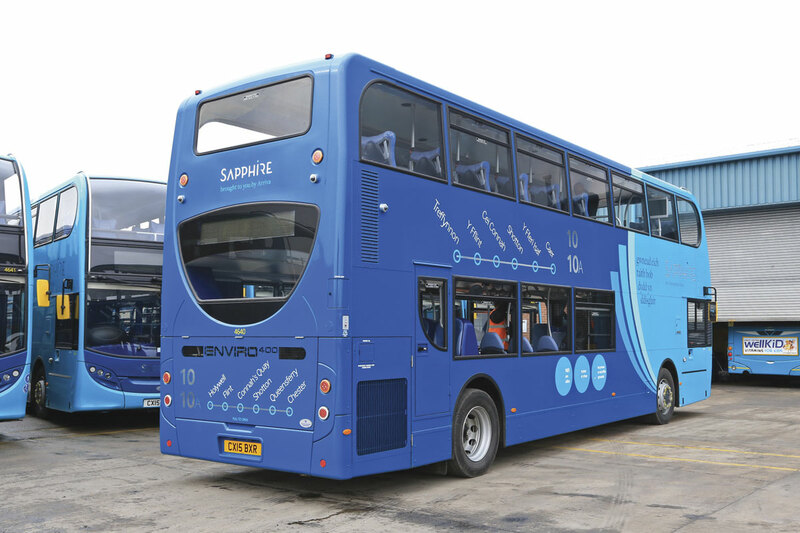 On upgrading to Sapphire standard, the 10A service will be introduced, extending alternate service 10 journeys from Connah’s Quay alongside the Dee Estuary to Flint and Holywell. Services 10 and 10A combined will maintain a 15 minute frequency between Connah’s Quay and Chester through the populous Deeside area. 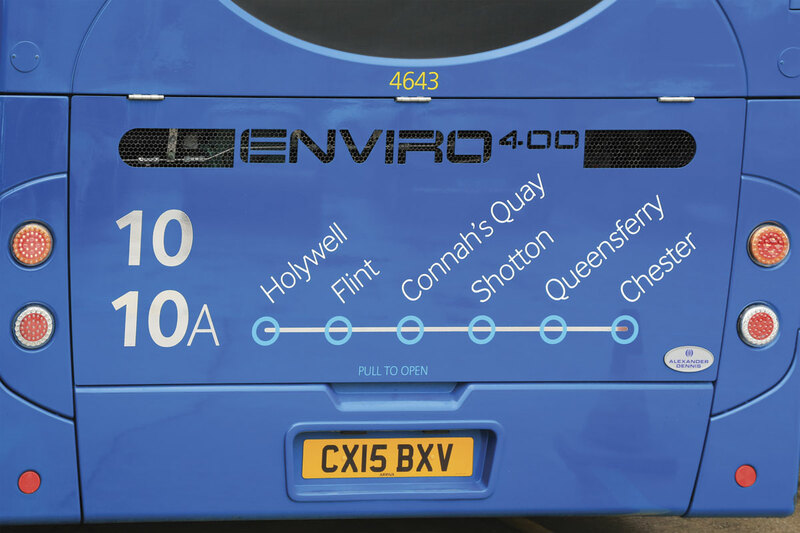 At Holywell, service 10A will provide a connection for Rhyl into the previously upgraded Coastliner service which takes an alternative route from Chester. In the evenings and on Sundays, service 10 terminates at Connah’s Quay, following a circular route around the town. At the Chester end, the service arrives at the bus interchange and then follows a complex loop through the city centre to terminate at the railway station, inbound and outbound vehicles using the same streets in the same direction at several points. The service crosses the English-Welsh border on the city’s outskirts with consequent challenges surrounding concessionary pass availability. Welsh passes are however valid through to Chester, providing the journey commences or terminates in Wales. Michael Morton indicated that this caused no particular problems and the service had just two local authorities to deal with for reimbursement. A range of bi-lingual timetable leaflets has been published with clear mapping of the route, fare offers and timetables. Leaflets for house to house distribution include vouchers for two free single journeys on service 10/10A to be taken by 2 April. In a specific promotion aimed at modal transfer, a 10-for-10 week ticket valid for unlimited travel on service 10/10A and other Arriva buses between Chester and Holywell is on offer at £10. The upgraded service 10 requires nine vehicles and Arriva Buses Wales chose the ADL Enviro400s following experience with their operation on previously upgraded routes. The Euro5 engined vehicles are built to a low height specification at 4.2m allowing flexibility in deployment. 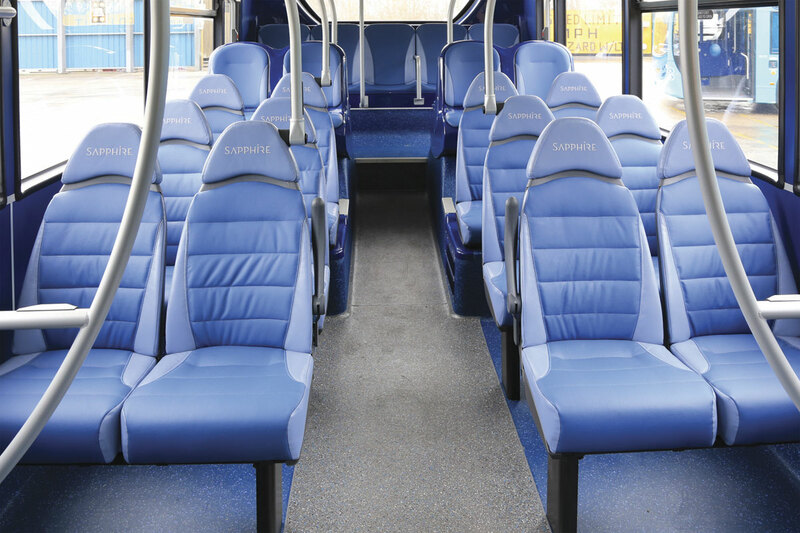 Seating for 60 is provided on E-leather trimmed Esteban seats including 12 high backed bus seats with headrests downstairs and 28 full coach seats in a two plus one arrangement upstairs. Wheelarch and rear seats are also E-leather trimmed. Customers have access to Wi-Fi supplied by Icomera and charging points for mobile devices. A full audio-visual display system is installed with a monitor on each deck for the visual element and audible next stop announcements. Following experience of the impact of message overload, service 10/10A will have concise next stop announcements in clear English only other than at the termini. Welsh language next stop announcements can be added should customer feedback indicate a requirement for them. 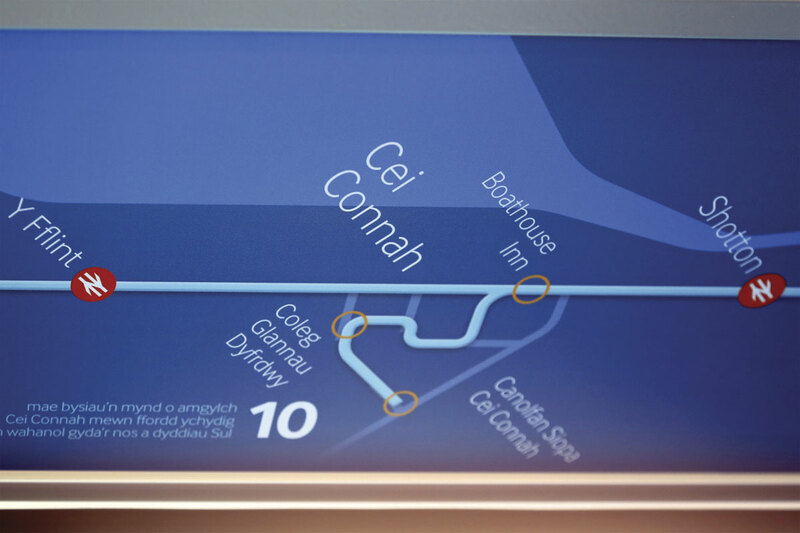 Visual displays will be in English and Welsh, the use of both languages being perpetuated in the internal route maps and exterior route information. Externally, the rear and nearside are in English with the offside in Welsh and digital destination displays alternate between languages. The availability of free wi-fi is a key feature of the Sapphire brand, together with the provision of charging facilities. Arriva’s Head of Marketing, UK Bus, Cora Robinson, explained that Arriva had looked to make it as simple as possible to use, particularly for regular customers. The system recognises the IP address of a customer’s device and connects automatically. If the IP address is not recognised, a new customer for example, a very simple log on form involves just answering the question as to the purpose of the journey and, if further marketing contact from Arriva is required, providing an email address. Showing English branding on its nearside and Welsh ‘not in service’ on the destination display, one of the Enviro400s departs on a driver familiarisation run. When Bus and Coach Buyer reported in depth on the Arriva North West and Wales operation in April 2014, Arriva Buses Wales operated 181 vehicles from its four depots. In the subsequent year, this has grown to 196 vehicles with 44 of them delivered within the twelve months. 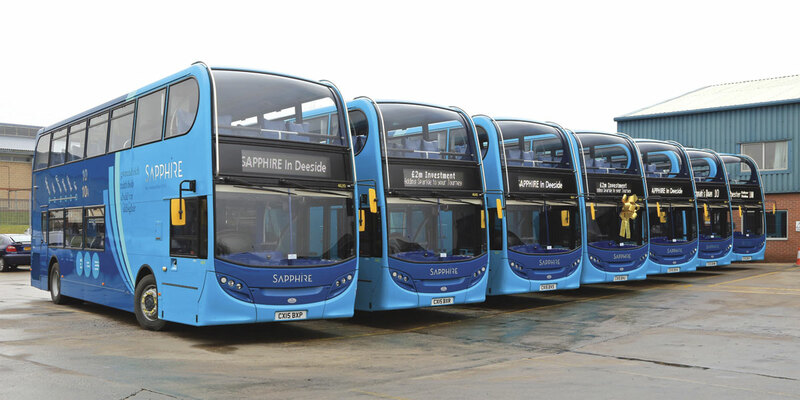 In addition to the nine Sapphire vehicles for the 10/10A, 20 Sapphire standard vehicles were introduced in July 2014, increasing the frequency on the busy Rhyl to Llandudno service 12 to every ten minutes and augmenting the fifteen single deck vehicles introduced on the 5/5X Cymru Coastliner between Llandudno and Caernarfon in March 2014. The age profile of the fleet will be further reduced by July 2015 with the arrival of eleven ADL Enviro 200s to replace older single-deck vehicles. Increased frequencies on existing routes and the replacement services introduced following the closure of Padarn Bus have also contributed to the growth of the operation. Two additional refurbished double-deckers have been added to Arriva’s original Sapphire service, the 1 between Wrexham and Chester launched in April 2013. In addition a scheme has been implemented along its route whereby buses will stop at any stop where people are standing in the vicinity whether requested or not. This recognises that not all disabilities are visible and has been hailed a success by disabled groups in the area. A roll out to other routes is being considered. Arriva’s MAX product reached North Wales in January 2015 with the introduction of refurbished single-deckers on the 51/51S between Rhyl and Denbigh. 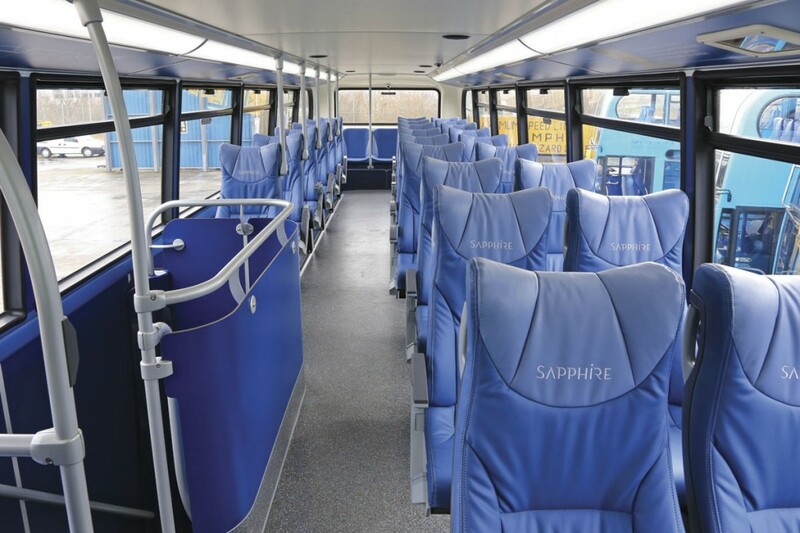 Michael Morton reported that the relaunched service experienced patronage growth from day one in the same manner as the Sapphire and Coastliner services upgraded in 2014. Alongside growing the business, Arriva Buses Wales has also focussed on developing its staff through completion of the CPC programme, Investors in People and achieving Gold Standard in the Welsh Government’s Corporate Health improvement scheme. Although referred to as Chester, Arriva Buses Wales’ depot is appropriately just over the Welsh border in Hawarden alongside the airport and Airbus UK site. Purpose built in 1999, it has extensive external parking areas, fuelling and washing facilities together with a six bay maintenance building. 36 vehicles are currently operated from the location. Attached to the building is the administration block that includes the training area where CPC training for North Wales based staff is undertaken. In the reception areas, the eye was drawn to a series of high quality posters showing the appropriate manner to park and manoeuvre vehicles at key locations including Chester railway station. The new vehicles continue the transformation of Arriva’s operations in North Wales which now provide customers with the opportunity to travel from Chester to Caernarfon using high specification vehicles throughout.